Juliana is a picky eater – she doesn’t like to try new foods, she tells me she doesn’t like things or that she is allergic to them if she doesn’t want to eat. 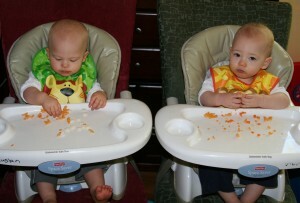 I wanted to do a better job with the boys – have them like more foods and not be afraid to try new things. 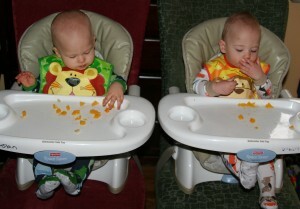 Ruslan will eat anything we put on his tray. Tried and true, new, odd looking – everything is picked up and tasted. And in most cases he is happy to eat whatever we give him. 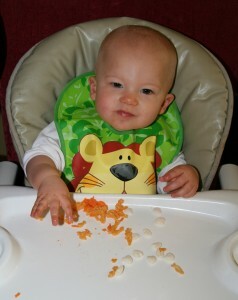 I give the same foods to both boys and Wyatt is skeptical of everything on his tray. If it is something he doesn’t like, he does one of three things: he pushes it away, picks it up and throws the food on the floor, or he picks up the food and moves it to the drink indentation on the tray. New foods are poked with one finger first and then slowly moved toward his mouth for a taste – if he does not approve he spits out every bit sometimes gagging in the process. 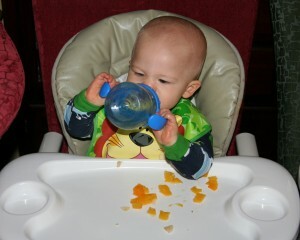 Food that he likes is shoveled into his mouth with both hands. 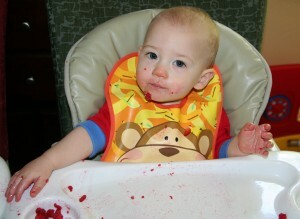 It is amazing how quickly he can consume a pile of strawberry pieces. 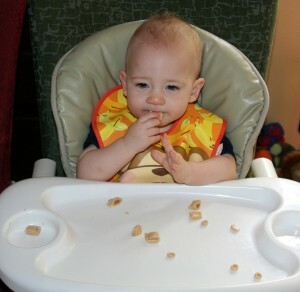 Wyatt enjoys most fruits, bread-type foods – pancakes, waffles, multi-grain bread, etc, and eggs. Vegetables are usually thrown to the floor and most things with a sauce are pushed aside – even macaroni and cheese. 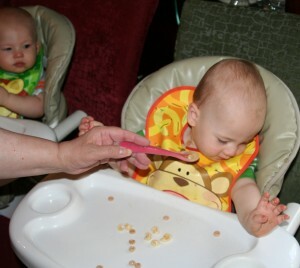 Trying to feed Wyatt something he doesn’t want will only make him close his mouth tight and turn completely around. He surprised us by eating spaghetti and meatballs (meatballs cut into bite-sized pieces), however this may have been a one time thing. He won’t eat the Gerber ravioli, but he loves potato and cheese pierogis. 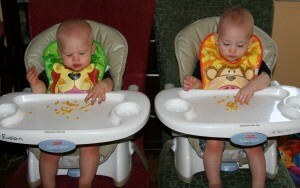 So we have our own twin study on eating habits at our house and in this case some children eat better than others no matter how you feed them. 1 comment to Are Picky Eaters Born or Made?